Nicole Archer, a visiting faculty member at the San Francisco Art Institute in California since 2009, has been appointed assistant professor in history and theory of contemporary art at her school. The position is tenure track. Emily Engel has joined the College of Mount Saint Vincent in Riverdale, New York, as a tenure-track professor of art history and chair of the Fine Arts Department. In addition to her teaching and research responsibilities in the history of Latin American art, Engel will develop majors in studio art and art history for the college. Ruthann Godollei has been named a DeWitt Wallace Professor of Art in the Department of Art and Art History at Macalester College in Saint Paul, Minnesota. Her courses include printmaking, the senior seminar, and topics such as dissent. Janet Kraynak has been appointed associate dean for the School of Art and Design History and Theory at Parsons the New School for Design in New York. Beauvais Lyons, Chancellor’s Professor at the University of Tennessee in Knoxville, has been awarded an Ellen McClung Berry professorship for 2013–15. J. P. Park has joined the History of Art Department at the University of California, Riverside, as an assistant professor of East Asian art. Park was formerly an assistant professor at the University of Colorado in Boulder. Howard Singerman has joined Hunter College, City University of New York, as Caroff Chair of the Department of Art and Art History. Previously he was chair of the McIntire Department of Art at the University of Virginia in Charlottesville. Renata Holod, curator of the Near East section at the University of Pennsylvania Museum in Philadelphia, has been elected president of the board of trustees of the Ukranian Museum in New York. Kimberly L. Jones has joined the Dallas Museum of Art in Texas as Ellen and Harry S. Parker III Assistant Curator of the Arts of America. She previously worked as a curator and lecturer at the University of Texas at Austin. Danielle Rice, formerly executive director of the Delaware Art Museum in Wilmington, has been appointed director of the new graduate degree program in museum leadership in the Westphal College of Media Arts and Design at Drexel University in Philadelphia, Pennsylvania. Marika Sardar has accepted the post of associate curator of Southern Asian and Islamic art at the San Diego Museum of Art in California. Sylvie Fortin has been tapped to lead the next Biennale de Montréal as executive and artistic director. The multisite exhibition in the province of Quebec will take place in 2014–15. Brooke Kamin Rappaport, most recently an independent curator and specialist in modern and contemporary sculpture, has been appointed senior curator of the Madison Square Park Conservancy in New York. The Archives of American Art, a branch of the Smithsonian Institution based in New York and Washington, DC, has received a $37,500 grant from the Terra Foundation for American Art to support its first symposium on digital humanities and American art, scheduled for November 2013. The Art Institute of Chicago in Illinois has received a $125,000 grant from the Terra Foundation for American Art to support an exhibition called Art and Appetite: American Painting, Culture, and Cuisine, which will open in November 2013. The Art Institute of Chicago in Illinois has received a $100,000 grant from the Terra Foundation for American Art to support the development and implementation of “American Sources: Using Visual Art in the Humanities Curriculum,” a yearlong professional-development program that will explore the use of American artworks as primary documents and guide participants in the development of related curriculum for middle and high school students in the region. Artspace, a nonprofit art organization in New Haven, Connecticut, has received a 2013 grant from the Foundation for Contemporary Arts. The Association of Research Institutes in Art History, an organization based in Miami Beach, Florida, has accepted a $75,000 grant from the Terra Foundation for American Art to support three research fellowships in American art. The Bard Graduate Center in New York has recieved a 2013 grant from the Graham Foundation for Advanced Studies in the Fine Arts. The school will use the funds for the exhibition Artek: Design, Domesticity, and the Public Sphere. The Canadian Center for Architecture in Montreal, Quebec, has received a 2013 grant from the Graham Foundation for Advanced Studies in the Fine Arts. The institution will use the funds for a publication, Chandigarh and Casablanca: Modern Urbanism, New Geographies. Columbia College Chicago in Illinois has applied a $40,000 grant from the Terra Foundation for American Art toward a professional-development program for teachers in twenty-five public schools in Chicago for the 2012–13 academic year. DePaul University in Chicago, Illinois, has received a $12,560 grant from the Terra Foundation for American Art to support an exhibition called For and against Modernity: The Armory Show + 100, which took place at the DePaul Art Museum earlier this year. Elmhurst College in Elmhurst, Illinois, has spent a $18,870 grant from the Terra Foundation for American Art on a public symposium that explored the role of humor in American art of the 1960s through the 1980s. The event took place on April 27, 2013, in partnership with the DePaul Art Museum. The Getty Research Institute in Los Angeles, California, has acquired the archive of the photographer Lewis Baltz, which includes his negatives, prints and proofs, ephemera, photographs, and publications. The Solomon R. Guggenheim Foundation in New York has accepted a $200,000 grant from the Terra Foundation for American Art to support its forthcoming exhibition, Robert Motherwell: The Early Collages. The Herron Art Library at Indiana University–Purdue University Indianapolis has become the only American library housing a permanent art collection honoring the literary history of Iraq. The library signed an agreement with an international coalition of artists and writers to preserve and showcase a collection of more than three hundred printed materials remembering the destruction of al-Mutanabbi Street, the centuries-old literary center of Baghdad. The Los Angeles County Museum of Art in California, the Art Gallery of New South Wales in Sydney, Australia, and the National Museum of Korea in Seoul have collaborated on an exhibition project called America: Painting a Nation, which received $849,968 in funds from the Terra Foundation of American Art. The Metropolitan Museum of Art in New York has accepted a $300,000 grant from the Terra Foundation for American Art to support American West in Bronze, 1850–1925, an exhibition that will open in December 2013 and later travel to Denver, Colorado, and to China. Montana State University in Bozeman has accepted a $30,140 grant from the Terra Foundation for American Art to support an international scholarly conference, “Dialect[ic]s of Diplomacy: American and French Political Portraits during the Revolutionary and Federal Areas, circa 1776–1815.” The event will take place at the Smithsonian Institution’s National Portrait Gallery in Washington, DC, in September 2014. The Moore College of Art and Design in Philadelphia, Pennsylvania, has created a new website. The school invites students, faculty, alumni, and others to visit the site and return often for updates. New York University has received a $20,000 grant from the Terra Foundation for American Art to support an international graduate-student symposium, “Mapping the Landscape: Geography, Power, and the Imagination in the Art of the Americas,” which was held March 7–8, 2013. The Pennsylvania Academy of the Fine Arts in Philadelphia has established a new endowment for the purchase of contemporary works of art. The school’s goal is to greatly increase an aspect of the acquisitions program that has long been critical to building the renowned collection of the academy’s museum. San Francisco State University in California has received a $95,165 grant from the Terra Foundation for American Art to support an exhibition in its Fine Arts Gallery called The Moment for Ink, which took place earlier in 2013. The School of the Art Institute of Chicago in Illinois has applied a 2013 grant from the Graham Foundation for Advanced Studies in the Fine Arts for a public lecture “Toyo Ito: Architecture after 3.11,” taking place on October 15, 2013. The Smithsonian American Art Museum in Washington, DC, has acquired one hundred photographs from the Irving Penn Foundation. The gift includes rare street photographs from the late 1930s and 1940s, many of which are unpublished; images of postwar Europe; iconic portraits of figures such as Agnes de Mille, Langston Hughes, and Truman Capote; color photographs made for magazine editorials and commercial advertising; self-portraits; and some of Penn’s most recognizable fashion and still-life photographs. An exhibition is planned for 2015. The Smithsonian American Art Museum and its Renwick Gallery, both in Washington, DC, have received a $25,000 grant from the Terra Foundation for American Art to support travel by a to-be-appointed international member of the American Art editorial board to strengthen the journal’s global ties and networks. The Terra Foundation for American Art in Chicago, Illinois, has awarded itself a $733,210 grant to support a three-year initiative, “American Art at the Core of Learning,” which helps cultural organizations in Chicago to address the new Common Core State Standards in English Language Arts. The Terra Foundation for American Art in Chicago, Illinois, has applied a $117,000 grant toward supporting its international publication initiative, “Perspectives in American Art,” which explores fundamental ideas shaping American art and culture. The Terra Foundation for American Art in Chicago, Illinois, has earmarked a $79,000 grant to support the 2014 Terra Research Travel Grants, which have been awarded annually since 2003. The Terra Foundation for American Art in Chicago, Illinois, has awarded itself a $150,000 grant to support a scholarly peer-reviewed anthology to accompany the single-painting exhibition, Samuel F. B. Morse’s “Gallery of the Louvre” and the Art of Invention, during its upcoming tour of American museums. The Terra Foundation for American Art in Chicago, Illinois, has used a $39,000 grant to support planning for programming focused on Chicago’s art and design legacy. The funds support an advisory committee to assess program and content ideas for the initiative and to develop an initiative plan, including various kinds of public and K–12 programs, archival projects, publications, and more. The University of Glasgow in Scotland has won a $100,000 grant from the Terra Foundation for American Art to support an inventory of historical American art in public collections in the United Kingdom. The University of Kentucky in Lexington has taken a $61,443 grant from the Terra Foundaiton for American Art to support an academic conference called “American Art in Exhibition: Presentations of American Art at Home and Abroad from the Nineteenth Century to the Present,” that will take place November 15–16, 2013, at Tsinghua University in China. The University of Nottingham in Nottingham, England, has used a $17,450 grant from the Terra Foundation for American Art to support a two-day symposium, “Art across the Black Diaspora: Visualizing Slavery in America,” which took place in May 2013 at the Rothermere American Institute at the University of Oxford. The University of Wisconsin, Milwaukee, has received a 2013 grant from the Graham Foundation for Advanced Studies in the Fine Arts to help produce an exhibition called The Uncertainty of Enclosure: Leo Saul Berk and Bruce Goff, to be held in summer 2014. The Wolfsonian at Florida International University in Miami Beach, Florida, has received a 2013 grant from the Graham Foundation for Advanced Studies in the Fine Arts. The museum will use the funds to publish a special issue of the Journal of Decorative and Propaganda Arts on Turkey. Why No Nobel Prize for Art? Dissertation titles in art history and visual studies from American and Canadian institutions, both completed and in progress, are published annually in caa.reviews, making them available through web searches. PhD-granting institutions may send a list of their doctoral students’ dissertation titles for 2013 to dissertations@collegeart.org. The complete Dissertation Submission Guidelines regarding the format of listings are now available. CAA does not accept listings from individuals. Improperly formatted lists will be returned to sender. For more information, please write to the above email address or visit the guidelines page. Deadline: January 15, 2014. Ruthann Godollei, DeWitt Wallace Professor of Art in the Department of Art and Art History at Macalester College in Saint Paul, Minnesota, was awarded the 2013 Thomas Jefferson Award for teaching and service to the college. Michelle Kogan, an artist based in Chicago, Illinois, has received a 2013 Individual Artist Program Grant from the city of Chicago’s Department of Cultural Affairs and Special Events Grants Department. Jacqueline Marie Musacchio has been awarded the inaugural ARIAH Prize for Online Publishing from the Association of Research Institutes in Art History. Musacchio’s winning article, “Infesting the Galleries of Europe: The Copyist Emma Conant Church in Paris and Rome,” was published in the Autumn 2011 issue of Nineteenth-Century Art Worldwide. Kori Newkirk, an artist based in Los Angeles, California, has won a $10,000 FOCAFellowship Award for 2013 from the Fellows of Contemporary Art. Josette Urso has received a 2013–14 Adolph and Esther Gottlieb Foundation Grant for her painting. CAA has begun mailing Conference Information and Registration, which provides important details, instructions, and deadlines for attending and participating in the 102nd Annual Conference, to all individual and institutional CAA members. Nonmembers and those wanting a digital file now can download a PDF of the booklet. 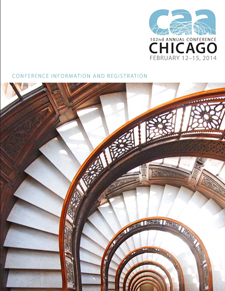 The conference will take place February 12–15, 2014, in Chicago. Following sections on registration and CAA membership, Conference Information and Registration describes travel, lodging, and transportation options and explains the basic processes for candidates seeking jobs and employers placing classifieds and renting booths and tables in the Interview Hall. In addition, the publication lists topics for eleven Professional-Development Workshops. If you want to connect with former and current professors and students, consult the Reunions and Receptions page. The booklet includes paper forms for CAA membership, conference registration, workshops, special events, and mentoring enrollment. Judith K. Brodsky. An Odyssey of Dreams: A Decade of Paintings 2003–2012. Anne Kittrell Art Gallery, University of Arkansas, Fayetteville, Arkansas, November 4–December 6, 2013. Judith K. Brodsky. An Odyssey of Dreams: A Decade of Paintings 2003–2012. Bradbury Gallery, Fowler Center, Arkansas State University, Jonesboro, Arkansas, August 29–September 29, 2013. Shlomit Dror. F_ll in the Bl_nk. New York Art Residency and Studios (NARS) Foundation, Brooklyn, New York, June 21–July 19, 2013. Reni Gower. Papercuts. Emily Davis Gallery, Myers School of Art, University of Akron, Akron, Ohio, October 28–December 6, 2013. Patrick Greaney. Heimrad Bäcker: Landscape M. Museum of Contemporary Art Denver, Denver, Colorado, September 27, 2013–January 5, 2014. Adrienne Klein. Graphic Alert: AIDS Posters from around the World. MSB Gallery, Langone Medical Center, New York University, New York, September 1–30, 2013. Theresa Papanikolas. Georgia O’Keeffe and Ansel Adams: The Hawai‘i Pictures. Honolulu Museum of Art, Honolulu, Hawai‘i, July 18, 2013–January 12, 2014. Jeff Phillips. Resonating Images: 1950 to Now. William Rolland Gallery of Fine Art, California Lutheran University, Thousand Oaks, California, June 7–November 8, 2013. Mira Schor. Abstract Marriage: Sculpture by Ilya Schor and Resia Schor. Provincetown Art Association and Museum, Provincetown, Massachusetts, August 16–September 29, 2013. Basile Baudez. Architecture et tradition académique au siècle des Lumières (Rennes, France: Presses universitaires de Rennes, 2013). Ömür Harmanşah. Cities and the Shaping of Memory in the Ancient Near East (New York: Cambridge University Press, 2013). Sarah Blake McHam. Pliny and the Artistic Culture of the Italian Renaissance: The Legacy of the “Natural History” (New Haven: Yale University Press, 2013). Elizabeth Valdez del Álamo. Palace of the Mind: The Cloister of Silos and Spanish Sculpture of the Twelfth Century (Turnhout, Belgium: Brepols, 2012). In its regular roundup of obituaries, CAA recognizes the lives and achievements of the following artists, historians, curators, educators, and others whose work has significantly influenced the visual arts. Notable deaths this summer and fall include the artists Stephen Antonakos and Mark Gottsegen and the Renaissance art historian Mark Zucker.